The Olisur olive oil factory designed by GH + A (Guillermo Hevia Architects) is perfect for its location: its shape and the materials used in it are the architectural expression of the features of the landscape at Fundo San José de Marchigüe, an estate in central Chile. The project addresses the need for sustainable production by making use of natural ventilation and light. 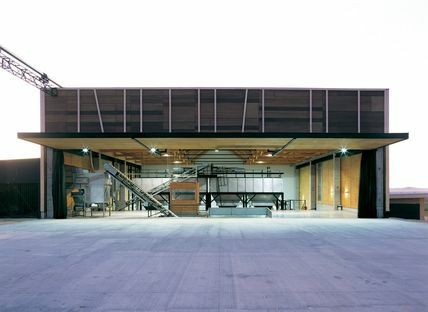 GH + A (Guillermo Hevia Architects) is an interesting Chilean design studio based in Las Condes (Santiago) which constructed the Olisur olive oil factory in Chile’s central valley. 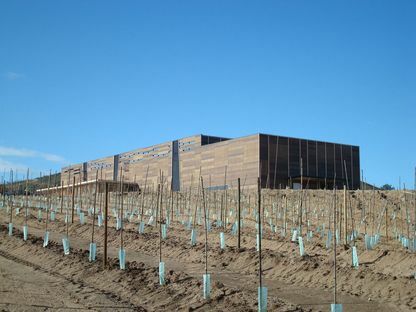 The plant and offices are located on the Fundo San José de Marchigüe, an estate in a barren, sun-baked landscape dominated by the colours of the earth and the olive trees. 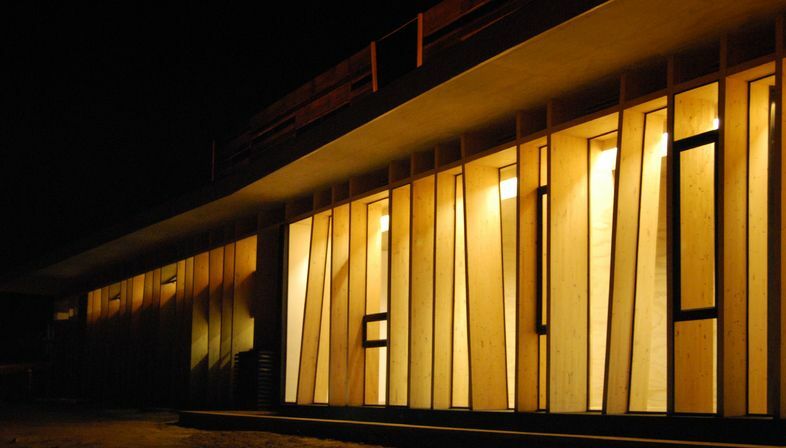 The project makes use of simple technologies that take advantage of the local climate to create a sustainable building. The most striking thing about the building is the use of wood in its walls, drawing a map of the material’s many different shades and illustrating the potential of architecture to blend into nature. 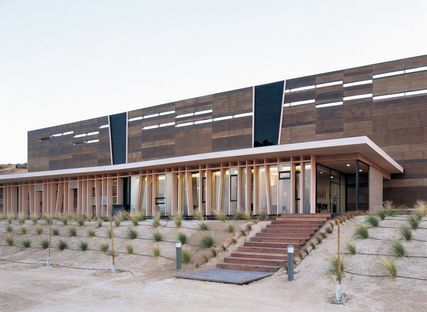 The horizontal wooden boards follow the shape of the main building, the one containing the plant: their many colours schematically reproduce the infinite hues of the earth around them, dominating an arid landscape dotted by green olive trees. The volume’s apparent severity does not contrast with the natural environment, thanks to the variations in the size and colour of the wooden boards and the inclusion of openings with oblique cuts that interrupt the rhythm. The sloped, gabled roof is hidden by walls as high as the top of the wooden trusses, but the ventilated façades have random openings through which we can glimpse the sky, contributing to the “musicality” of the whole. Empty and full volumes, variations in the hues of the wood, perpendicular lines interrupted by diagonals: the façades tone down the severity required of the construction for functional reasons. The effect of the lines in the office building, a small glass volume juxtaposed with the plant to the north, is similar. As we observe the façades and follow the slope of the lines forming the two volumes, their attempt to blend into the gentle natural slope of the land becomes clear. The goal of constructing a building that is truly appropriate for its location inspires the architects to use bioclimatic technologies to save energy. The plant makes use of geothermal energy, natural ventilation and sunlight wherever possible to improve oil production and improve the quality of the working environment in the factory. Team members: Tomás Villalón A., Francisco Carrión G., Guillermo Hevia García, Marcela Suazo M.
Structural design: Arauco S. A. Builder: Constructora Pitagora LTDA, BIOTECH Chile Consultores Ltda.